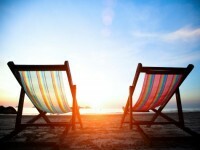 Enjoy the last glories of summer sun, as news has surfaced that the Farmer’s Almanac is predicting a bitterly cold and stormy winter. Even this early, there are steps you can take to protect your home from the ravages of winter. 1. Have your home tested for mold and other toxins. If you suffered any leaks or flooding, MAKE SURE the mold and toxins are gone before you close the door on this season. If moisture or mold lurks behind your walls or under floorboards, you can count on a full-blown mold infestation by next spring. Have your home tested now by a certified microbial inspector. He will let you know if your home is safe to close for the winter. 2. Prepare your home’s exterior. 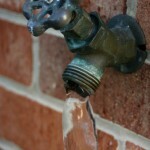 Turn off water to outside faucets and drain hoses before storing them. Take all furniture and outdoor recreational equipment indoors so that it does not fly away if there are strong winds. You should also shut the fireplace flues and dampers to avoid anything unwanted coming down the chimney. If you have storm shutters, make sure they are closed and secured. Finally, make sure your gutters are clean and downspouts are angled away from your home to avoid flooding and ice dams later on. 3. Turn off the main water supply. Pipes can freeze and burst during winter if they are filled with water and the heat is off. So, turn off the main water supply and open all faucets and drain them. If your home is located in a very cold region, you may even want to drain the toilets and water heater. For more information on how to winterize a toilet, click here. Many experts suggest adding RV or boat antifreeze to the toilet and sink. 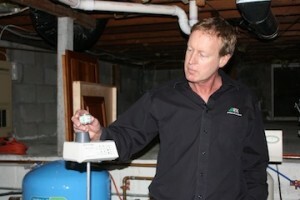 To see how to drain a water heater, click here. It may seem incongruous to turn on the heat as it is still warm outside, but in a few months when the temperature drops below freezing, a heated house, even at 50 degrees, will prevent your pipes from freezing and keep your home dry through the winter. Most experts recommend keeping the thermostat between 50° F and 58°. 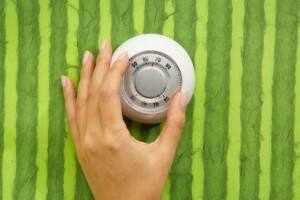 The heat won’t kick in until the indoor temperature drops below the thermostat’s temperature setting. But, if you are concerned, you can subscribe to an Internet-based system with equipment that monitors the inside air temperature and alerts you to freezing temperatures. 5. Clean out the refrigerator and freezer. Some people choose to empty them completely, and turn off the unit for the season. If you do this, be sure to prop the doors open to prevent mold growth inside. If you decide to leave the fridge on, do not leave anything in it that may spoil if the power goes out. This can be especially dangerous if you leave food in the freezer and lose power for an extended period of time. When the power goes back on, the food will refreeze, and you won’t know that it had defrosted and probably rotted. 6. Set up a system for snow removal. If your home is in the Northeast, it’s a sure bet that you’ll see snow. The only question is, how much? 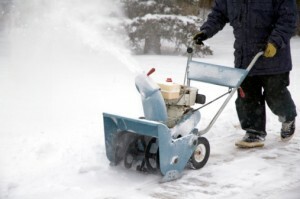 Make provisions now for a snow removal company or friend to remove snow once it reaches a certain height. This will help to prevent ice dams on the roof and leaks in the basement, which can cause mold to grow within 24-48 hours. If you want to be extra cautious, you may want to have someone stop by periodically to make sure nothing is awry. If you have any questions, please feel free to call us at (800) 392-6468. We’ll be happy to answer your questions or set up an appointment to test your home for mold or any other toxin.